Possibly residing on ice-rich planets in our solar system and beyond, superionic ice is an exotic type of ice that exists at high temperature and high pressure. In superionic ice, the water molecules dissociate into charged atoms (ions), with the oxygen ions locked in a solid lattice. The researchers from Princeton University conducted a comprehensive study on the different phases that superionic ice can undergo, looking at how the oxygen lattice changed and the liquid hydrogen moved. They calculated the ionic conductivity and hydrogen diffusivity of each phase. They found that the ionic conductivity increases dramatically when the ice changes from the solid phase to the superionic phase. The change of conductivity is either gradual or abrupt depending on the superionic phase. Abrupt and gradual changes of conductivity are also observed in materials that can be superionic at atmospheric pressure. For example, an abrupt change of conductivity is observed in silver iodide (AgI) while a gradual conductivity change is observed in lead disulfide (PbS2). What is unusual about superionic ice is that these two types of conductivity changes are observed in the same material at different thermodynamic conditions. The Princeton University researchers simulated what would happen if the superionic form was put under extreme pressures, from 280 GPa to 1.3 TPa. They discovered the ice has competing phases within a close-packed oxygen lattice. As the pressure climbs, the close-packed structure becomes unstable. The lattice morphs into a new unusual phase, which is associated with a gradual change in ionic conductivity. The team also found that the higher pressure lowers the temperature necessary for the ice to transition to superionic phases. 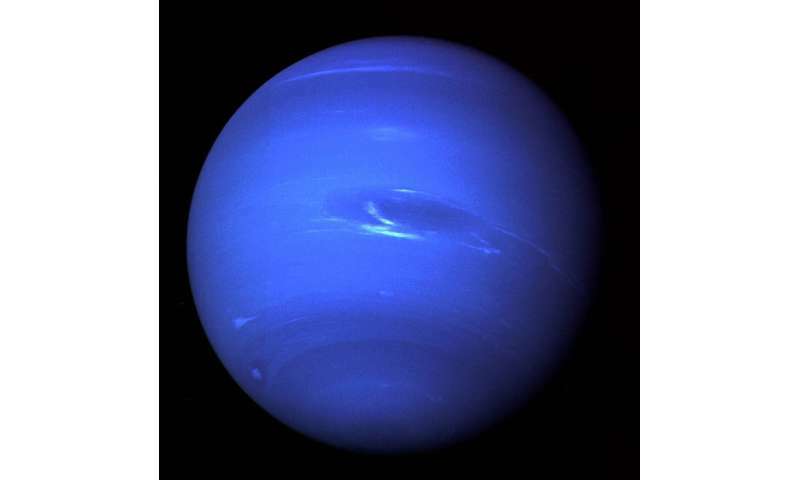 Scientists predicted a new phase of superionic ice, a special form of ice that could exist on Uranus, Neptune, and exoplanets. This new type of ice, called P21/c-SI phase, occurs at pressures greater than those found inside the giant ice planets of our solar system. Ummm.... so it can't exist in Uranus and Neptune? Those two sentences to not appear to agree with each other.